Posted Jan 18, 2019 by Eds. Motorways and ferry ports–and a horse racecourse–have been blockaded again, as well as some regional police headquarters and town halls. And one of Macron’s MPs woke up one morning to find their house entrance bricked up. In early January, another minister was made to scurry out the back door of his office, as demonstrators smashed in his front door with a handy forklift. He later squealed something about “extreme violence threatening the Republic”. Prime minister Edouard Philippe has announced new laws to deal with “violence at demonstrations”, with more rights for police to keep files on people and ban them from demonstrating. Meanwhile, in a sign of panic among the elite, a former Conservative minister of education, Luc Ferry, called on the police to shoot demonstrators who fight back. “They should use their guns once and for all… we have the fourth largest army in the world and we can’t stop these bastards?”, he squealed. Otherwise, Macron is hoping that the three-month “Great National Debate” he has announced will help calm the revolt. Polls show 41 percent of the population intend to take part (and since Macron is personally thought to be doing a good job by only 20 percent of the population, one can understand the reasons for his debate). It is a risky tactic. Left wing MPs from the left wing party France Insoumise are mocking the initiative in the media, and the grand debate got off to a limping start, as the person appointed to organise it resigned a few days after her appointment, once she saw that public opinion was shocked at her salary–15,000 euros a month. The debate idea is to send ministers out to a series of public forums around the country, and ask town mayors to collect written opinions. But as one minister commented: “Do we really want to go out to community halls and get tarred and feathered? It’s a risk”. Ministerial teams are making lists of “safe towns” to go to. There may not be many–Macron himself can hardly go anywhere without a protest demonstration these days. In addition, a number of local mayors have said they don’t want to be involved in organising the debate: “We don’t want to be associated with failed policies”, they explained. Left organisations have been working on how to intervene in this novel kind of movement. There are practically no open interventions on the demonstrations–no leafleting or bookstalls, no placards or banners from parties or campaigning organisations. At times, this has been because some demonstrations resembled riots, but even now that the demonstrations are often calmer, this has not changed. 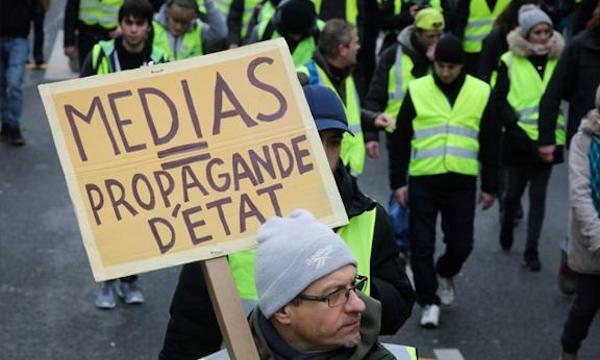 In the meetings held in many towns, left political activists are very much involved, but mostly the political intervention is separated out–the declarations appear on TV, on websites, in leaflets separate from the moments of Yellow Vest agitation etc. This is because the left organisations respect the “non-partisan” atmosphere of the movement, which issues partly from its class nature mentioned above.